* SE HA SOLICITADO AL VICERRECTORADO DE ORDENACIÓN ACADÉMICA EL RECONOCIMIENTO DE CRÉDITOS ECTS Y DE LIBRE CONFIGURACIÓN. LOS ESTUDIANTES INTERESADOS EN LA CONVALIDACIÓN DE CRÉDITOS DEBERÁN SOLICITAR PREVIAMENTE SU INSCRIPCIÓN A TRAVÉS DE LA BIBLIOTECA PÚBLICA MUNICIPAL DE CARMONA Y ASISTIR AL MENOS AL 80% DE LAS CONFERENCIAS. * TFNO. BIBLIOTECA: 954 19 14 58. 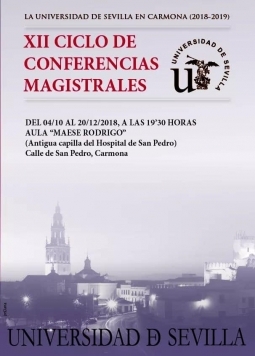 * HORARIO INSCRIPCIÓN: MAÑANAS: 9:30 A 14:30 H. TARDES: 16:00 A 20:30 H.
* SE ADJUNTA EL PROGRAMA DE CONFERENCIAS EN DOCUMENTO PDF.